Giada’s Baked Caprese Salad has become one of my summertime favorites. I get to use fresh tomatoes and basil from my garden. I started using kosher salt (because I’m really into it right now) in this recipe, instead of the regular kitchen salt and I really liked it that way. I even made this recipe on my charcoal grill. I was really happy with the way it turned out, except the cheese won’t get that golden color on top. • Preheat the oven t 450 degrees F.
Arrange the sliced baguette bread on a baking sheet. Brush with some of the olive oil and sprinkle with salt. Bake until the bread is pale golden and crisp, about 5 minutes. Top each slice of bread with a slice of tomato and sprinkle with salt and pepper. Top each slice of tomato with a slice of mozzarella and sprinkle with salt. 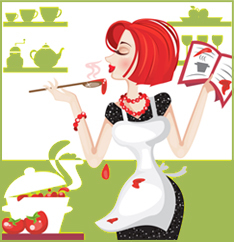 Return the baking sheet to the oven until the cheese and tomato are warmed, about 5 minutes. Arrange the toasts on a serving platter. Top each toast with a basil leaf. Using the brush, drizzle the remaining olive oil over the basil. Sprinkle with salt and pepper, and serve. If you would like a higher resolution card to print out, we also have that available to you for free. 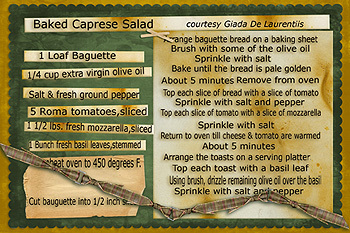 Please email us for this card at: Recipe Card It is important that you tell us which card it is that you would like. Keep in mind that you will need a software program to print this out with, and it comes in a zipped format. You can download Winzip for free by clicking on the link.